You are here: Home > News > New book ‘Glamour and Gloom’ launches in time for Christmas! Glamour and Gloom: 1930s Architecture in Belfast is a richly illustrated book that consists of three essays and nineteen case studies on a selection of modern buildings that together display the architectural wealth of this decade in Belfast. Most of the texts were researched and written by architecture students at Ulster University under the direction of Dr Tanja Poppelreuter, lecturer in the History and Theory of Architecture. 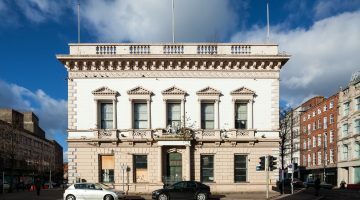 Buildings featured in the book include the Bank of Ireland which was planned at the cusp of the Great Depression and inspired by American skyscrapers so that it displays the aims and aspiration of the architect and the bank regarding future prosperity. Cinemas housed the new technology that made synchronised sound possible and the new ‘Talkies’ sparked a cinema boom. The architecture of the new picture palaces epitomised the glamour of Hollywood and offered a distraction from everyday life. The rise of consumerism is reflected in the luxurious facade of Sinclair’s Department Store and an echo of ‘Egyptomania’ – that that had begun with Howard Carter discovering the tomb of King Tutankhamen – reverberates in the design of Woolworth’s Department Store. Amenities such as telephones, radios and refrigerators, that are ubiquitous today, proliferated during the 1930s. Clothing stores such as Burton’s the Tailors provided smart outfits for everyone, and new school buildings improved primary education of children. Together, these buildings remind us of a decade during which decisive changes towards a modern way of life took place. The editor Dr Tanja Poppelreuter holds a PhD from Frankfurt University and is a Lecturer at the Belfast School of Architecture and the Built Environment, Ulster University. She specialises in the architectural history and theory of the 20th century. She is a member of the Historic Buildings Council for Northern Ireland, the All Irish Architectural Research Group (AIARG) and was awarded the David Saunders Founders Grant as well as the Milka Bliznakov Research Prize. Published by the Ulster Architectural Heritage Society in 2017, the book is available from the Society online at www.uahs.org.uk or from the Society’s offices at The Old Museum Building, 7 College Square North, Belfast BT1 6AR and from all good bookshops, price: £18.